This page will walk the user through configuring the settings found under UserName > My Settings. User specific settings can also be entered to customize your specific experience with TRAKnet. You can access your user specific settings by clicking on the username in the upper right-hand corner of TRAKnet, then selecting My Settings from the dropdown menu. My Settings contains a variety of options for personal preferences. These settings are detailed below. My Display Name – This will determine how the user name appears throughout the system. Default user for tasks & messages – This setting will determine which user will be automatically assigned to the tasks and messages you generate. Default Dashboard – This setting will allow the user to determine which dashboard will be the default view on the patient’s chart. 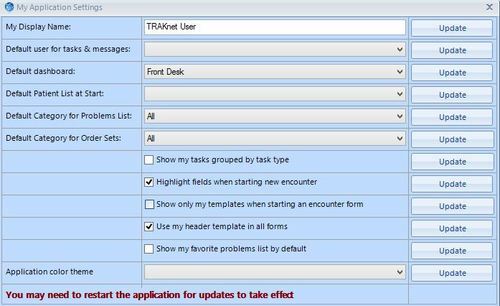 Default Patient List at Start – This setting will determine which patient quick list will be defaulted upon opening TRAKnet 3.0. Default Category for Problems List – This will default the problems list upon entering TRAKnet 3.0. Default Category for Order Sets – This will default the order set upon entering TRAKnet 3.0. Application Color Theme – This feature will become activate at a later release of TRAKnet 3.0, but will allow for the color scheme of the software to be determined per user. Please keep in mind that you may need to restart the application for these changes to take an effect. Note: When updating My Settings, you must click update next to any line you change. There is no update all button.